Traditional educational approaches often focus on theory as opposed to practical application, which does not define STEM CTE programs, according to Frank Xydias, engineering instructor at Milford High School & Applied Technology Center in Milford. “Many of the problems we solve in STEM classes are open-ended and grounded in solving real-world problems,” he said. Such real-world problems often involve the needs of real people, which was precisely the case with Morgan Peterson, a 11-year-old middle school student, who last year presented Xydias and his students with a unique opportunity. In approaching Xydias about the possibility his students could solve her daughter’s problem, Meg Peterson, who works in the district as a Title 1 Coordinator at the elementary level, said she was excited at the prospect. No one, however, was more enthusiastic than Morgan herself provided Xydias and the students satisfied her one condition. “My first reaction was that I wanted to work with them,” she said. She did work with them, according to her mom, who said it was “pretty amazing” to see her daughter work and interact with high school students. “It was great to see her just walking around with those high school students—it was like a think tank thing,” she said. According to Meg, the students and her daughter designed solutions that were consequently printed via a 3D printer. Noting the team produced several iterations up the adaptor before the final version, Meg said the entire process was “incredible” and serves to bolster her belief in the power of STEM and STEAM in general. 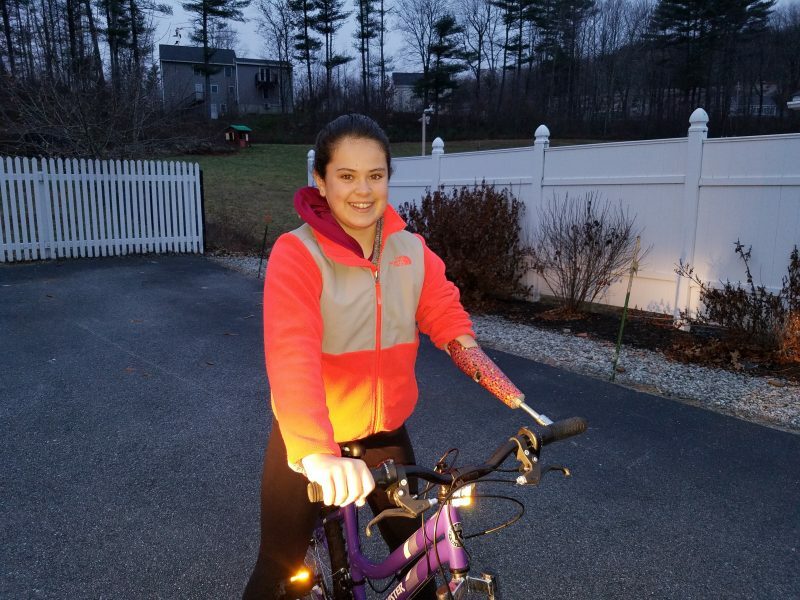 Citing her own interest in pursuing CTE in either manufacturing or the culinary arts when she is in high school, Morgan said the best thing about her collaboration with Xydias’ team is that she loves to ride her bike. As for what advice she might give other students her age who might be thinking about their respective futures, Morgan said CTE taught her something very important. “It doesn’t matter who you are or what you do, you can always find a way to solve the problem,” she said.